There’s rain going on in the southern Mid-Atlantic Region, and that has cancelled games, postponed games and forced games to move up. But there’s also a discussion about heat and humidity in one conference, and that is forcing games to move as well. This year, the Minnesota Intercollegiate Athletic Conference instituted a heat and humidity policy which is affecting some games this weekend. It’s favored by the athletic trainers, perhaps grudgingly accepted by coaches and … well, fans aren’t fans. But the MIAC commissioner, Dan McKane, joins us to discuss the issue. Since our interview, three more MIAC games had their game times changed, and one of those required a change in venue. Meanwhile, our featured interview for this podcast is Tom Journell, the Carleton head coach who came to the school this season, having been a head coach at UW-Stevens Point and Elmhurst. 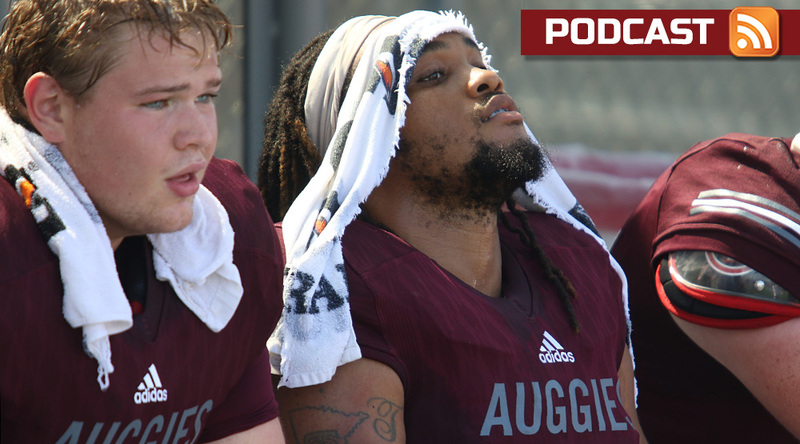 He followed his son, who is a standout wide receiver for Carleton, and talks with us about the challenges of recruiting to one of the nation’s elite liberal arts colleges, learning all the new fight songs and what it’s like when sprinklers interrupt your game. Plus, we get you around the nation to all of the weekend’s big games. It’s Game Day for Division III football! Yep, we’re eight weeks into the season and it’s finally time to talk in-depth about the postseason — picks, prognostications, problems and the like. If you’re new to Division III, we’ll give you a quick roundup of how it’s set up and if you’re a veteran, we’re ready to talk about strength of schedule and who the top at-large candidates are. Will three WIAC teams make it? 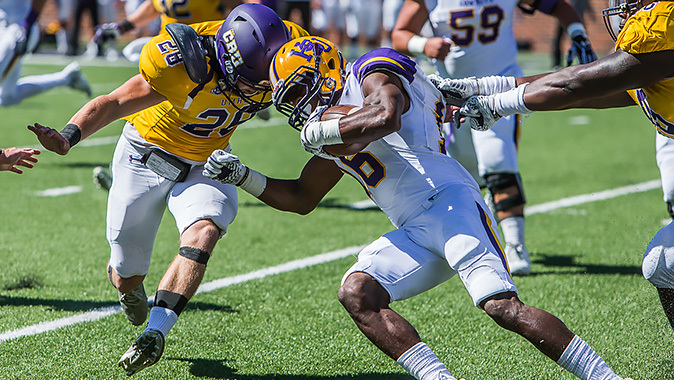 Can Hardin-Simmons avoid playing Mary Hardin-Baylor in the first round? The first full answers are in this podcast. It’s too early for this group to be peaking and on the way down, so we’ve exhorted our panel to continue to bring their best here in Week 8. 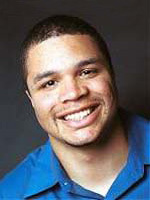 Our guest this week is Derek Jones, who has called Rowan games on WGLS for more than a decade and not long ago became the station’s general manager. Keith’s take: No. 11 Hardin-Simmons at No. 3 UMHB. Could make a case for games that will eliminate teams from playoff race, but I’d rather see if UMHB is No. 1-worthy. Ryan’s take: No. 11 Hardin-Simmons at No. 3 UMHB. This is my favorite conference rivalry in the nation — and that’s been the case for more than a decade. Pat’s take: No. 7 UW-Platteville at No. 5 UW-Oshkosh. I’m just going to play the full Midwesterner card here, plus note that the loser is in a world of hurt for playoffs. Adam’s take: I want to see what No. 8 Linfield does in its second big test of the season. The Wildcats can prove something with a convincing win at 5-1 Whitworth. Frank’s take: No. 25 Delaware Valley at No. 15 Stevenson. The Mustangs are one of three undefeated East teams left but DelVal is on a roll. Loser might be eliminated from playoffs. Derek’s take: Rowan vs. Wesley. It’s a must win for Wesley with Salisbury looming in a few weeks. The door on the postseason may close if they can’t win. 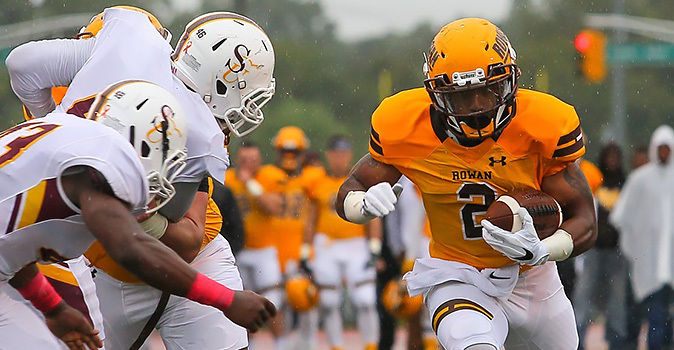 If Rowan prevails, it puts them a step closer to an NJAC title. Keith’s take: No. 16 St. Lawrence. This may be a reach, but all but one Merchant Marine game has been decided by 4 or fewer, and the Saints only give up 7 a game. In NYC rain, could get interesting. Ryan’s take: No. 21 Rowan. Can we assume that Wesley has found it’s groove by now? Pat’s take: No. 2 UW-Whitewater. Going up to the top for this one, at home to UW-Stevens Point. UWW has given up a ton of yards in recent weeks and needs to get healthy on defense. Soon. Adam’s take: No. 21 Rowan, by Wesley. Despite two losses, the Wolverines are very much alive. To keep intact Wesley’s goal of extending its playoff streak to 12 years, this is a must-win. Frank’s take: No. 16 St. Lawrence, at Merchant Marine. I picked it on “In the HuddLLe,” so I’ll stay with it here. With rain in the forecast, the triple-option will lead the Mariners to a major upset. Guest’s take: No. 15 Stevenson. They’ve had a terrible time with Delaware Valley no matter where the game is. The Aggies responded well after the loss to Albright and need this one to keep their postseason hopes afloat. Which game between ranked teams will be the closest? Keith’s take: No. 25 Delaware Valley at No. 15 Stevenson. The Mustangs probably pull it out, but they have to work for it. Ryan’s take: No. 7 UW-Platteville at No. 5 UW-Oshkosh. Fully expect this to be a one-score game. Pat’s take: No. 25 Delaware Valley at No. 15 Stevenson. That should be a barn-burner, perhaps the best atmosphere for a game this week. Adam’s take: No. 7 UW-Platteville at No. 5 UW-Oshkosh. Point differential against UWW and UWSP: Titans plus-7, Pioneers plus-10. Both teams narrowly lost to the Warhawks and defeated the Pointers. Frank’s take: No. 7 UW-Platteville at No. 5 UW-Oshkosh. They played UW-Whitewater virtually evenly in narrow losses. It’s doubtful either pulls away here. Guest’s take: No. 11 Hardin-Simmons at No. 3 Mary Hardin-Baylor. Both teams know how to score but the defenses will come to play. Which team brings its ‘A’ game this weekend? Keith’s take: Alma and their odd helmets continue the turnaround under Greg Pscodna vs. Albion, which is stunningly 0-6 after a nine-win season. Ryan’s take: Adrian, over Kalamazoo. To stay in the hunt, the Bulldogs need to take care of business. Pat’s take: Adrian, vs. Kalamazoo. The Bulldogs have to be smarting from their unexpected loss to Hope last week and will be bringing their ‘A’ game. Adam’s take: Albright. After starting 0-2, the Lions can force a four-way tie atop the MAC if they can defeat Wilkes and No. 25 Delaware Valley knocks off No. 15 Stevenson. Frank’s take: Albright, at Wilkes. The Lions will make it five straight wins after an 0-2 start, giving them slight hope in the MAC race. 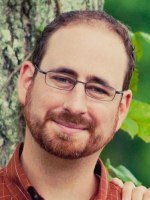 Guest’s take: Averett, my father’s alma mater. They’ve scored 117 points in their last two games and play at Maryville on Saturday in a USAC battle. There are 25 winless teams remaining. Pick one to win this week. Keith’s take: Morrisville State. The Mustangs are gaining 400 yards a game, about 40% of it on the ground, but are giving up 39 points. Ryan’s take: Morrisville State. Playing the E8 wild card here. Pat’s take: Loras, at Simpson. The Duhawks have a disappointing record but have only been blown out once. Adam’s take: Dickinson finds just enough offense to snap a nine-game losing streak. The Red Devils win on the road at McDaniel. Frank’s take: Finlandia, vs. Maranatha Baptist. Time to give our independent teams some love. Finlandia beat them twice last year, so here’s to a three-peat. Guest’s take: TCNJ. They allowed 116 points vs. Salisbury, Wesley, and Frostburg State. Granted, it’s at Montclair State but the low-scoring Red Hawks will feel like a vacation in comparison. Rowan, Salisbury, Frostburg and CNU each enter the weekend with one loss. Which team(s) stay that way? Keith’s take: The Maryland two. Rowan won’t score enough to beat Wesley, and I have to pick the Bobcats, even if out of totally transparent allegiance to the sleepers piece I wrote for Kickoff. Ryan’s take: Salisbury and CNU. Both are ready to shake off their losses to Rowan. Pat’s take: Salisbury and Frostburg. I like home field for Frostburg after a long drive for CNU, but that’s about the only factor I could use. Adam’s take: The NJAC tie is down to three teams–Wesley, Salisbury, CNU–after this week. Frank’s take: Salisbury and Frostburg. Rowan will struggle vs. Wesley. Frostburg will handle a struggling CNU offense. I can’t see Kean beating Salisbury, especially in rain. Guest’s take: Rowan, Salisbury, and Frostburg. It will not be easy for Rowan or Frostburg but their defenses could carry them through tough opponents. If so, that sets up quite the battle next week when Rowan travels to Frostburg State.